The body needs sodium to function properly, but too much sodium increases the risk for stroke, heart attack, high blood pressure and kidney disease. 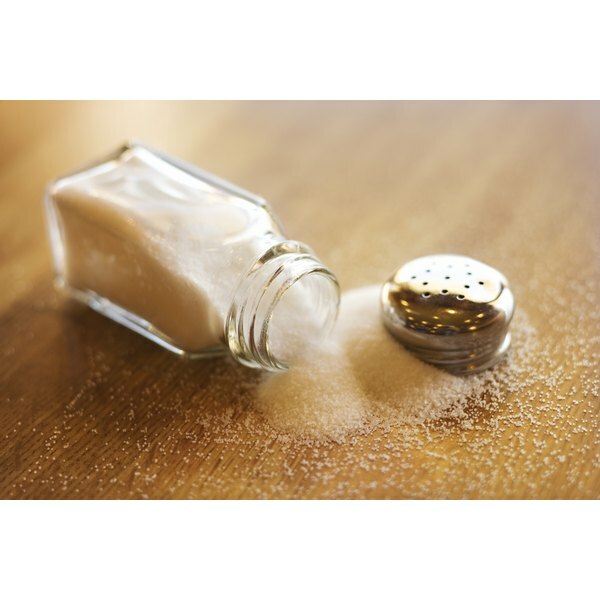 The Centers For Disease Control says healthy adults should consume no more than 2,300 milligrams of sodium per day. Those with high blood pressure, kidney disease or risk factors for heart problems should consume 1,500 milligrams of sodium or less each day. Fast food restaurants offer quick and relatively inexpensive meals and snacks. This convenience comes at a price — many fast-food items contain high levels of sodium. One apple pie from a fast food restaurant, for example, contains 400 mg of sodium, according to Colorado State University Extension. A chicken dinner from one of these restaurants contains approximately 2,243 milligrams of sodium. A fish sandwich from a fast-food restaurant has 882 milligrams of sodium. The use of spreads and garnishes can turn low-sodium choices into high-sodium foods that increase daily sodium intake substantially. To reduce sodium intake, limit use of condiments, sauces and other garnishes. Ketchup, mustard, soy sauce, salad dressing and sauces contain sodium. Soy sauce has nearly half the recommended daily intake of sodium, with 1,029 milligrams of sodium per 1-tablespoon serving, according to Colorado State University Extension. Ketchup has 156 milligrams of sodium per tablespoon This represents more than 10 percent of the daily sodium intake recommended for someone following a low-sodium diet of 1,500 milligrams per day. In addition to high levels of fat and sugar, some baked goods also contain significant amounts of sodium. The University of Maine reports that a medium doughnut contains 257 milligrams of sodium, which accounts for more than 10 percent of the recommended daily intake. A slice of bread contains 120 to 211 milligrams of sodium, depending on the ingredients and preparation methods used. Other high-sodium baked goods include biscuits, muffins, baked pie crust and sweet rolls. Canned goods contain salt, which preserves the vegetables and prevents them from spoiling quickly. Salt also adds flavor to canned goods. High-sodium canned foods include canned kidney beans, pickled vegetables and sauerkraut. Colorado State University Extension reports that 1 cup of canned corn contains 384 milligrams of sodium. In contrast, fresh and frozen corn contain less than 10 milligrams of sodium per serving. Luncheon meats contain sodium for flavor and preservation, making it necessary to eat small serving sizes or limit the consumption of these meats. Palo Alto Medical Foundation explains that processed poultry, bologna, ham, salami and pastrami contain high levels of sodium. Oklahoma Cooperative Extension explains that processed cheeses contain disodium phosphate, which increases their sodium content. Cheese spreads also contain high levels of sodium. Examples of high-sodium cheeses include cheddar, Parmesan and American. About 1 ounce of American cheese, for example, contains 406 milligrams of sodium, according to Colorado State University Extension. Lower-sodium choices include cream cheese, Swiss cheese and mozzarella cheese. Some snack foods have salt for added flavor, making it necessary to choose salt-free varieties or limit the consumption of salted snacks. Salted nuts, pretzels, tortilla chips and potato chips add sodium to your daily diet. Just two sourdough pretzels, for example, contain 490 milligrams of sodium, according to Rice University.